Woodfired Squash Curry and Naan Bread – what a great way to start off the new year. A fantastic squash curry, inspired by our trips to India and full of flavour – so if you’re planning on cutting down on meat for a while, it doesn’t have to be boring; this one’s a real winner. To go with the curry, a naan bread as close as we can get to one from a curry shop with a crispy base and pillowy, soft top that you’ll just want to rip into. Serve with a some pickles and yoghurt and it’s a delicious way to start off your 2019 woodfired cooking. 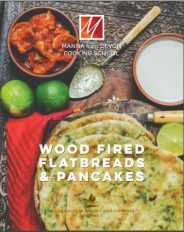 The video is on our Youtube Channel here and the recipe is also in our Woodfired Flatbreads & Pancakes. You’ll need a flat pan to cook the naan breads and a wok or saucepan to cook the curry. We use our Netheron Foundry pan for the naans and plonk its lid on our cast iron wok for the curry. Put the flour, yeast, salt, half the ghee and yoghurt into a bowl. Add the water and bring together to form a very soft dough. Turn the dough on to a clean surface and knead it for 10 minutes or so until it is smooth and satiny. Put the dough into a large bowl and cover with a plastic bag. Set it aside to prove for 1-2 hours until well risen and puffy. Divide the dough into 6 equal pieces and shape them into balls. Let the dough balls rest in a cool place for an hour, covered with oiled clingfilm to top the dough sticking. Moisten a patch of worktop with water and wet your hands. Shape your first dough ball into a rough teardrop or circle about ½ cm thick – do this on the patch of water. Heat a flat pan – we use our Netherton Foundry pan – in the oven and put the first naan bread in it when the pan is good and hot. the dough wants to go in water side to the pan. When the first bread is cooked, brush it with a little more ghee, put it into a basket and cover with a large clean cloth to keep it soft. Eat the naans as soon as possible with the squash curry. Heat a large wok style pan in the oven – a saucepan is fine if you haven’t got a wok. Add the oil and stir in the mustard seeds, curry leaves, Kashmiri chillies and onion. Cook at the edge of the oven until the onion starts to soften. Stir in the dried spices and season well with salt. Add the tomatoes and coconut milk and then stir in the squash cubes. Cover with a lid and cook gently in the oven until the squash is tender – about 10-15 minutes. 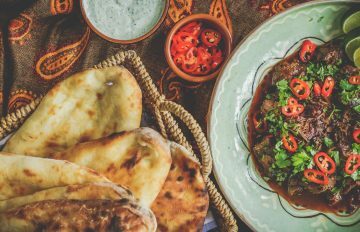 Keep warm while you finish off the naan breads – garnish with lime wedges, chopped fresh coriander and a drizzle of yoghurt. Ring the changes with different spices and increased levels of chilli if you want your curry a bit perkier. If you make too much, both the curry and the naan breads will freeze well – juet defrost both and reheat gently when you want to eat them.